When her parents split, Marcie is dragged from Idaho to a family summerhouse in New Hampshire. 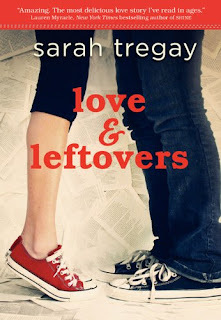 She leaves behind her friends, a group of freaks and geeks called the Leftovers, including her emo-rocker boyfriend, and her father. By the time Labor Day rolls around, Marcie suspects this "vacation" has become permanent. She starts at a new school where a cute boy brings her breakfast and a new romance heats up. But understanding love, especially when you've watched your parents' affections end, is elusive. What does it feel like, really? Can you even know it until you've lost it? Marcie is forced to leave everything she knows behind when her parents split. She has to say goodbye to her boyfriend, Linus, her friends (affectionately known as The Leftovers), and even her father and his new, younger boyfriend. She has a hard time fitting in at her new school in New Hampshire, and with her mom wallowing in depression as a result of the divorce, Marcie finds herself trying to find friends at school and be a normal teenager while playing the parent at home and watching over her mother. Her boyfriend keeps talking about how much he misses her, which causes Marcie to be more upset. She feels alone and left out, and all she wants is someone to pay her some attention and hold her. When a boy at her school starts showing some interest in her, she finds herself spending more and more time with him, and soon things start to escalate physically. But what about the love she has for Linus? Is what they have real, or will their love crumble like her parents’ did? I have to say I was pleasantly surprised by Love and Leftovers. The story is told from Marcie’s point of view, and consists of her entries in her poetry journal. I do not particularly care for poetry, so I had some reservations when I started reading, but those reservations quickly vanished and I really got drawn into the story. This book is beautifully written and I really enjoyed reading it. Maybe I should try giving poetry another shot? I really felt for Marcie. After trying to start afresh at a new school, she finds herself unable to fit in, and she feels isolated from everyone. She starts having doubts that many girls have. Is there something wrong with her? Is she socially awkward? She also starts thinking about her relationship with Linus. He never made a move on her, but doesn’t every 16-17 year boy want to get intimate with their girlfriend? Could Linus possibly be gay like her dad, which could explain why he never tried anything? Or is she just unattractive? Her emotions came across really well through her journal, and I felt like I understood Marcie. All the pain, sadness and happiness she feels, and even the doubts she has about herself, really make her character easy to connect to. Through her journal, the reader gets to see how Marcie matures and learns from the mistakes she makes, and I really liked her growing process. Overall, this was a really well written, cute story, and I really enjoyed reading it. I had a big smile on my face at certain times and there were other times where I laughed out loud. I would definitely check it out if you haven’t already! This was an excellent debut by Tregay and I am excited to see what she comes out with next!